SUPERIOR AERATION: Your fine, expensive red wines require superior aeration to release their unique bouquet. With Vinetto aerator and decanter spout you can infuse your precious wines with the right amount of air that will allow them to bring forth all their rich aromas and subtle flavors. PREMIUM QUALITY & SOPHISTICATED DESIGN: Made with premium quality, FDA approved materials, this exclusive red wine aerator spout pourer is made to last. It has a beautiful, ergonomically designed swan-neck pouring spout that is slanted at 150 degrees for easier pouring. A must have for all wine enthusiasts and connoisseurs, its sleek design makes it an excellent gift idea for aspiring sommeliers. 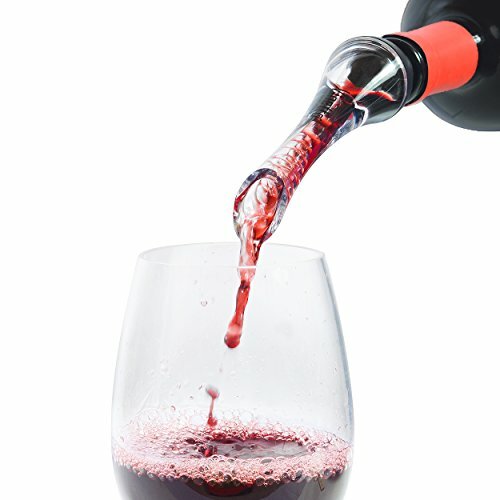 AN ELEGANT ADDITION TO YOUR CELEBRATION TABLES: Add a tone of luxurious sophistication to your perfectly dressed tables for any celebration and impress your guests with your unique sense of style, thanks to this elegant, red wine bottle top air funnel. MESS-FREE DECANTING: Vinetto wine aerating pourer features an anti-drip rubber stopper that ensures mess free, precision pouring at all times, so you no longer have to worry about embarrassing red wine stains on your expensive tablecloths. LIFETIME SATISFACTION GUARANTEED: Being so sure about the top quality and excellent performance of our exclusive red wine aerator, Vinetto offers you a Lifetime money back guarantee. With nothing to lose, order one for you and one to give as a gift today! If you have any questions about this product by Vinetto, contact us by completing and submitting the form below. If you are looking for a specif part number, please include it with your message.